The Chiefs signed Manuel to a contract Friday, Brooke Pryor of The Kansas City Star reports. Analysis: While Manuel has plenty of NFL experience on his resume, not much of it is good. With the Chiefs already rostering Patrick Mahomes and Chad Henne, the 28-year-old signal-caller will likely battle Chase Litton to earn a spot as a third quarterback on the 53-man roster, but the odds may be stacked against him. 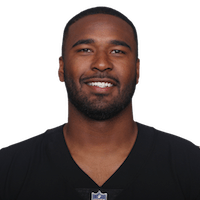 Manuel was one of several quarterbacks who worked out for San Francisco on Tuesday, Eric Branch of the San Francisco Chronicle reports. Analysis: The 49ers are in need of a quarterback after losing Jimmy Garoppolo for the season with a torn ACL, and Manuel looks to be in the mix for the job. C.J. Beathard is set to take over the starting duties, and he's currently the only healthy quarterback on the roster. 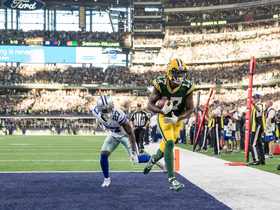 Manuel was released by Oakland in early September and has thrown for 20 touchdowns to 16 interceptions since being drafted in 2013. 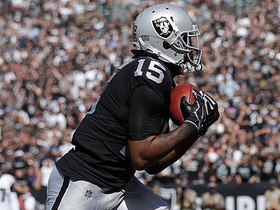 Manuel was released by the Raiders on Saturday, Scott Bair of NBC Sports Bay Area reports. Analysis: The Raiders also got rid of Connor Cook, leaving trade acquisition AJ McCarron as the only quarterback behind Derek Carr. It's an odd decision to make just nine days ahead of the season opener, especially given that McCarron may not even be an upgrade on Manuel/Cook. Manuel appears to have beat out Connor Cook for the raiders' backup quarterback job, Michael Gehlken of the Las Vegas Review-Journal reports. Analysis: Manuel completed 18 of 22 passes for 255 yards and three touchdowns in Thursday's 30-19 preseason win over Seattle, after Cook suffered through a 6-for-15 meltdown the previous week against Green Bay. Cook stuck around as the third-string quarterback the past two seasons, but Oakland may go with just two QBs this time around. Manuel completed four of six pass attempts for 46 yards and rushed for five yards on three carries during Friday's preseason win over the Lions. The Raiders re-signed Manuel on Thursday. 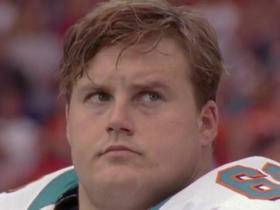 Dan Hanzus explains the Bills motivation for signing Richie Incognito. Check out the best plays from Sunday's action in Week 5. 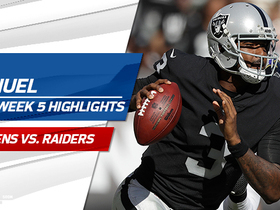 Check out highlights from Oakland Raiders quarterback EJ Manuel Week 5 matchup vs. the Baltimore Ravens. 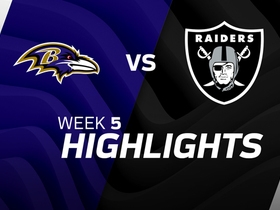 Watch the best plays from the week 5 matchup between the Baltimore Ravens and Oakland Raiders. 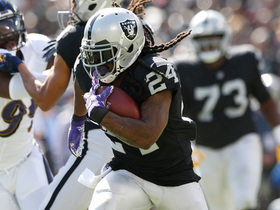 Oakland Raiders running back Marshawn Lynch makes a catch for 10 yards. 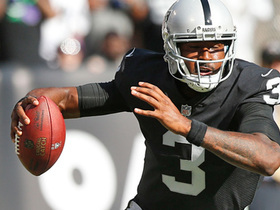 Oakland Raiders quarterback EJ Manuel runs for 10 yards in the red zone. 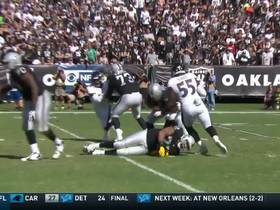 Baltimore Ravens outside linebacker Terrell Suggs sacks Oakland Raiders quarterback EJ Manuel for a loss of 6 yards. 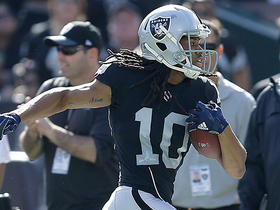 Oakland Raiders wide receiver Seth Roberts breaks tackle and runs down sideline, after review he is brought back 4 yards for a completion total of 22 yards. 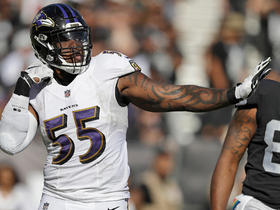 Baltimore Ravens linebacker Anthony Levine sacks EJ Mauel for a loss of 8 yards. Oakland Raiders quarterback EJ Manuel avoids a sack and throws a bomb to wide receiver Michael Crabtree for a 41-yard touchdown.